To purchase tickets visit broadwayboundfestival.com. BOTTOM LINE: Institutionalized after a tragic accident, an amnesiac woman confronts her fractured memories and damaged relationships. Like the fairy tales it references, Snow White Padded Room greets us in the voice of patriarchal authority, with cocky young author Mason (Max Henry) as the modern version of those fairy tales' omniscient narrators. Just as those storytellers roundly define the time, place, and worlds their characters inhabit, Mason’s new book, a critical analysis of fairy tales’ impact on modern love, claims to have found the source of women’s relationship woes. Adelaide (Jennifer Wilson McGuire), Mason’s feisty former lover, quickly interrupts his discourse—her insights unravel his baseless assumptions, willful omissions, and questionable “research” of recording drunken, vulnerable female interviewees. Yet Adelaide’s astuteness belies a similar unreliability, as the scene shifts to her bedroom in a psych hospital and their interaction is revealed to be a byproduct of her damaged mind. Her brain injured in a violent car accident, Adelaide has lost ten years of memory, and, at the direction of her husband Mark (Scott Lightfoot), now resides in a mental facility. Posing as a psychologist, Mark monitors Adelaide from behind her room’s two-way-mirror, ostensibly to protect her as she recovers. Equally isolated and under surveillance, Adelaide struggles to regain her sanity and piece together the truth of her circumstances. Adelaide’s disjointed flashbacks, and her comparably surreal interactions with Mark and her doctor (Emily Long), reveal the events that led her to question, grapple with, and flee her former life, a life of jealousy and infidelity that involved both Mason and Mark. Caught between these deceitful, controlling men, Adelaide self-identifies with the tale of “Snow White”—equally the passive princess and vilified queen, but chafing under either role. As details of the accident resurface and Mark’s manipulations throw her sanity into further question, Adelaide must determine just whose version of the story she can trust. Snow White Padded Room roots most of its action in Adelaide’s dual prisons of hospital and mind, with supporting characters walking the periphery of its narrow platform set. Like Snow White’s glass coffin, this arrangement detaches Adelaide from the world even as it displays her, barring any real connection to memories, loved ones, or self. The motif of a two-way mirror, a nod to the fairy tale’s magic object, creates a similar sense of externalized fate. This theme finds its crux in Adelaide and the Doctor’s dialogues through the barrier, but the actors’ full visibility during these sequences makes the invisible “magic mirror” concept a bit of a stretch. Likewise, Chelsie McPhilimy’s swirling, dark projections reflect Adelaide’s confusion but disappear amidst the other design elements. 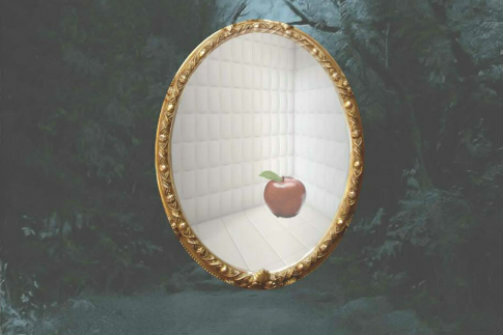 Though its fairy-tale metaphors can run heavy, Snow White Padded Room highlights our culture’s ability to lock individuals in a story not their own. With glass ceilings as oppressive as glass coffins, and male condescension challenging the strongest of sanities, modern women will find Adelaide’s story painfully familiar. Yet Adelaide’s critique of male-dominated systems does not stop her from buying into them; the same may be said of Long’s compassionate-but-complicit doctor or Ryan Natalino’s smitten intellectual. While these choices undermine the show's female characters, they also make a larger statement about how we trap ourselves in search of security. Though old narratives may shape our reality, Snow White Padded Room suggests that we may, with fierce awareness, rewrite them to serve our truth. Snow White Padded Room is written by Erin Moughon. Directed by Christopher Diercksen. Sound Design by Chet Miller. Projection Design by Chelsie McPhilimy. Stage Manager is Maddie Cohen. The cast is Jennifer Wilson McGuire, Max Henry, Scott Lightfoot, Emily Long, and Ryan Natalino.